INVAR alloys have a uniquely low thermal expansion coefficient and as the name suggests (derived from “invariable”) the material shows no or little changes in dimension at specific temperatures. Some key applications of INVAR alloys include thermostat devices, magnetic shielding, metrology devices and many more. Fe–Ni alloys with Ni concentration of around 35% have an extraordinarily low thermal expansion coefficient and their dimension is practically “invariable” near room temperature. Therefore, they are called INVAR alloys. These alloys show various anomalies in magnetic properties such as the deviation of the magnetization from the Slater–Pauling curve by decreasing the number of outer shell electrons, and the strong dependence of the Curie temperature TC (the transition temperature between ferromagnetic and paramagnetic phases) on the mean distance of the constituent atoms in alloys. Invar alloys, also known generically as FeNi36 (64FeNi in the US), is a Nickel steel alloy notable for its uniquely low coefficient of thermal expansion (CTE or α). It was invented in 1896 by Swiss scientist Charles Édouard Guillaume. He received the Nobel Prize in Physics in 1920 for this discovery, which shows the importance of this alloy in scientific instruments. “Invar” is a registered trademark of Arcelor Mittal, but FeNi36 is also manufactured by Japanese companies. Like other Nickel / iron compositions, Invar is a solid solution; that is, it is a single-phase alloy. All of the alloys in the Invar family are nickel-iron or nickel-iron-cobalt alloys and all exhibit face centered cubic crystal structure. As nickel increases from 36%, thermal expansion and Curie temperature also increase. Curie temperature increases from 280 °C (536 °F) for 36% nickel to greater than 565°C (1050°F) for 50% nickel. Alloys with invar composition are of interest to investigators because of their unusual physical properties. In 1960 Sedov et al. advanced first the hypothesis that the anomalies of the magnetic properties of the invar alloys can be attributed to the so-called “latent antiferromagnetism.” It was assumed that in the y phase of the invar alloy FeNi, the parameters of the exchange interaction energy of the electrons of the neighboring atoms, Ni-Ni and Ni-Fe, have opposite signs, negative for the Fe-Fe atoms. The possible occurrence of antiferromagnetism in the y-iron lattice was confirmed experimentally by the characteristic temperature dependence of the susceptibility of the paraprocess and by the temperature dependence of the Mossbauer spectra. Using the results of the measurements of the rotational hysteresis of Fe-Ni alloys, Nakamura estimated TN of the antiferromagnetically ordered regions. It turned out that they lie in the temperature region 35-50°K. Neutron-diffraction investigations carried out by Dubinin et al. confirmed the coexistence of paramagnetic and antiferromagnetic phases in Invar. 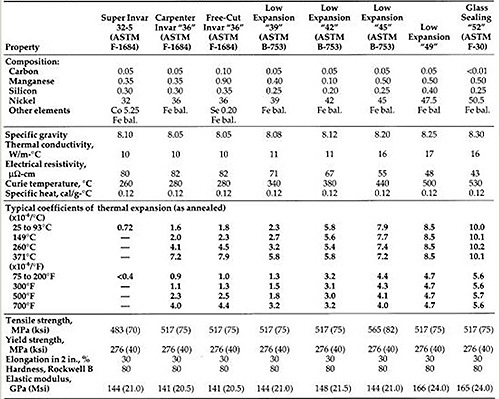 As mentioned above Invar (UNS number K93601) and related binary iron-nickel alloys have low coefficients of expansion over only a rather narrow range of temperature (see Figure 1). At low temperatures in the region from A to B, the coefficient of expansion is high. In the interval between B and C, the coefficient decreases, reaching a minimum in the region from C to D. With increasing temperature, the coefficient begins again to increase from D to E, and thereafter (from E to F), the expansion curve follows a trend similar to that of the nickel or iron of which the alloy is composed. The minimum expansivity prevails only in the range from C to D.